The Government of Japan maintains two government aircraft to transport the Prime Minister and other officials on visits for summit meetings and international conferences in foreign countries. 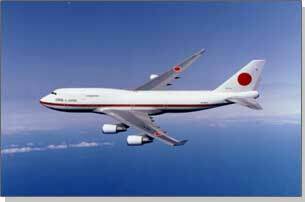 Both are Boeing 747-400, so-called "high-tech jumbo" jets that were introduced in 1991. These government aircraft are also to be used for emergency airlift of Japanese nationals staying overseas, international emergency relief aid operations, and contributions to United Nations Peacekeeping Operations (PKO). The aircraft are actually commanded by the Special Airlift Group of the Japan Air Self-Defense Force (SDF) at Chitose Air Base. In order to ensure safety, two aircraft fly together at all times with maintenance staff on board. The planes are equipped to special specifications, and include an onboard Prime Minister's Office, Secretary's Corner and Conference Room. The press also accompanies the Prime Minister, and onboard press conferences are sometimes carried out. Top-level diplomacy involves extremely tight scheduling of official events at every destination. Personnel responsible for government aircraft must always maintain the flight schedule, and therefore their jobs are said to involve constant stress. Thus, government aircraft provide support to handle the densely packed itineraries of top-level diplomacy.